We have certainly been busy bees with Dorset County Museum these last few weeks. Not only have Dippy tickets launched, but DCM have received some very exciting news. On the 1st October, our social media countdown came to a fun conclusion, launching Dippy tickets for all. We always knew that this would be a popular exhibition, but even we were a little surprised with the speed at which they were going. Quicker than we could utter ‘diplodocus’, February was completely sold out, and March was looking pretty thin on the ground. But don’t panic, you can still grab them here; https://www.dorsetcountymuseum.org/dcm/events/list/65/dippy-on-tour/. Now, for the big announcement… We are so delighted to say that the Heritage Lottery Fund have confirmed a huge £11.34 million for the lovely Dorset Museum! We are thrilled that the redevelopment can now go ahead- keep a look out for our Hidden Gems campaign in the coming weeks. 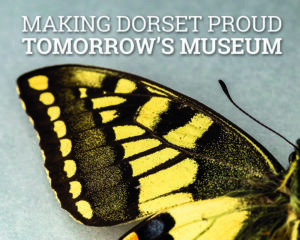 For now though, you can glory at the fabulous website we’ve created for Tomorrow’s Museum http://tomorrowsmuseumfordorset.org/, and of course book your Dippy tickets online.